The United States Congress designated the Table Mountain Wilderness (map) in 1989 and it now has a total of 92,627 acres. 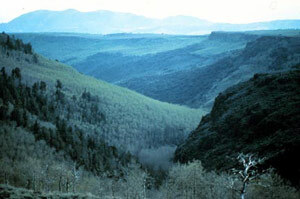 All of this wilderness is located in Nevada and is managed by the Forest Service. A unique high plateau, or tableland, distinguishes this Wilderness. This rolling, semiforested region attracts hikers and especially horsepackers. The Monitor Range, in which Table Mountain stands, rises above 10,000 feet and provides a home for one of the largest mule deer herds in the state. A well-established elk herd introduced in 1979 adds incentive for hunters. Five major streams attract anglers seeking trout. Large stands of aspen over much of the mountainsides are unusual in this region of central Nevada. Some of the aspens are carved with dates dating back as early as 1907 and well-preserved samples of Basque sheepherder art. The Barley Creek Trail, entering from the south, is the most used access. After five miles of hiking, you can take a steep one-mile side trail to the top of Table Mountain. Before you get to the side trail you'll pass alongside beaver ponds with good fishing. From where the Barley Creek Trail splits the west fork will take you to Dry Lake and all the way across the Wilderness to the Morgan Creek Trailhead on the north end, for a total walking distance of about 20 miles. Other trailheads can be accessed at Mosquito Creek on the west side, Clear Creek (which goes to Clear Lake) on the east side, and Green Monster Canyon on the east side. Planning to Visit the Table Mountain Wilderness? How to follow the seven standard Leave No Trace principles differs in different parts of the country (desert vs. Rocky Mountains). Click on any of the principles listed below to learn more about how they apply in the Table Mountain Wilderness.